ISRAELI RAILWAY - railmeds JimdoPage! 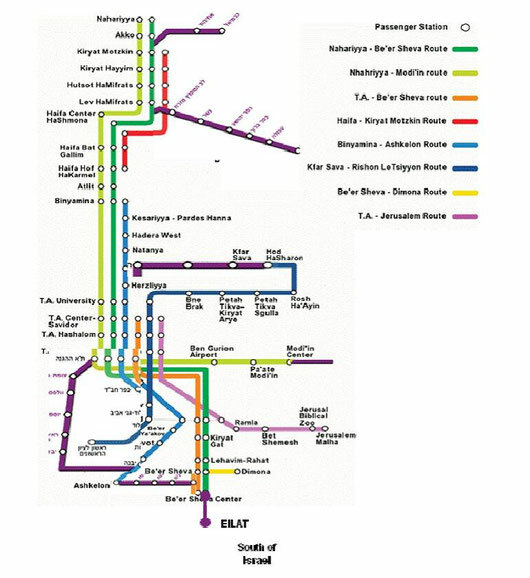 In Israel the road transport is the dominant sub-system, however, the rail system plays an important role in the transport mix. _ Annual investment in transport infrastructure is about 2 Billion Euro (2009-2010). _ The services are provided by the private and public sector. _ One international airport, Ben-Gurion Airport in Tel Aviv. Rail transport plays an important role in the national transport mix. However, there are no railway links to neighbouring country and there is no international freight and passenger transport on rail. Rail passenger transport was about 1,950 Mio. pkm in 2008. This is about 3% of total interurban passenger transport. The passenger rail transport was growing during the last five years at a yearly average of about 10%. Rail freight transport was at about 1,050 Mio tkm in 2008. This represents about 5% of total land freight transport. During the last five years the volume of freight transport was decreasing at an average of 2% per year. The Israeli railway network has a total length of 930 km. - 712 goods transport wagons. There are no railways links to adjacent countries. At present, Israel conventional railway network has no interface with the trans-European conventional rail system, therefore interoperability may not be a mandatory condition. However, Israel Railway Company designs, develops and upgrades its network and rolling stock in accordance with the European Standards set by the European Committee for Standardization. Also, the new rolling stock designs incorporate UIC standards and ERA TSI for crashworthiness, noise and emission. A preliminary feasibility study for a railway freight corridor between the seaport of Haifa and the Jordanian border (Haemek Railway), linking with the countries further east was carried out by the EuroMed Infrastructure Project. 800 Mio. EUR; planned operation: 2015. The study noted that establishing such a corridor would be viable. The new development plan for upgrading the railway network to Eilat would bring an opportunity for an additional corridor between Jordan and Israel in which freight can be transferred from the southern parts of the country to the seaports at Ashdod and Haifa. However, this link needs further studies. _ The Israel Railway Company Ltd is the national railway company. It is a government owned company. It has about 2,000 employees. _ Israel Department for Transport (the responsible authority for the Railways Company). Currently the national regulations are based on the railway act of 1972. _ Enabling operation of private entities. There is one set of financial statements for Israel Railways Company. However, there are notes separating infrastructure and operation, and freight and passengers activities. These separations commenced in 2003 when the Israel Railways Company was founded. Formerly, the railway operation was part of the Port Authority which included also the sea ports operations. In the year 2025 about 7 Mio. tons and 3 Mio. passengers are expected. On April 2008 the Israel Ministry of Transport and Road Safety established the Department of Railway Safety Regulation. At present, two positions are being held; Manager and Engineer. According to the new law, which is currently under legislation process, the regulation department will regulate economic aspects, licensing and services, and shall be responsible to carry out independent investigations on railway accidents. At present, railway accidents are being investigated by the railway company. In case of a fatal accident the police are being involved. The time frame for the setup is three years. Israel is a well developed country regarding rail use and infrastructure. European/UIC standards are the basis of the existing network and future lines. However, regarding the network it is an isolated country. There are no rail links with other countries. Regarding rail regional corridors, Israel is considering links to Jordan with an extension to the Palestinian Territories (Haemek Railway). Rail links with Egypt and Jordan through Israel in the Eilat region could be of benefit for the whole region. Benefits could be gained by introducing a first reliable land transport route and by avoiding a ferry connection. Furthermore, benefits for people and freight transport could be gained by linking Egypt and Israel to the planned Arab rail networks. However, these links are not a priority for Israel and Egypt. The first phase of a structural reform according to European guidelines was commenced in 2003 by establishing a commercial company separated for railway activities. A regulatory entity was established within the Ministry of Transport and a new law, enabling newcomers in railway activities start operating in the market, was drafted and will be submitted for approval of relevant authorities.